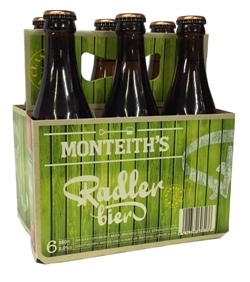 Monteith's Radler is a refreshingly fruity lager based on a style brewed in Bavaria. An easy-drinking beer brewed to full strength with light hoppy notes. A hint of natural lemonjuice adds a citrus twist offering a refreshing and distinctive tangy fruity character and zesty finish. The Radler is another Montieth's classic. sooooooo glad I found this site, just ordered two six packs. its going to remind so much of being in new Zealand. THE best lager in world. going to brighten up the English winter. keep it up Monteiths. After a trip to New Zealand and a tour around the Monteith's brewery in Greymouth, the Radler beer instantly became my favourite! It is very light with strong citrus tones making the beer extremely refreshing and fantastic whatever the occassion! Having spent over half a year in NZ and Australia during the summer, I managed to try many different thirst quenching beers. However, none even came close to this one. It's a truely refreshing, delicious beer.